The site for the memorial to the principal author of the Declaration of Independence and the third U.S. President was selected because of its strategic position in the plan of L'Enfant. The Capitol, the White House, and the Mall were established in the plan. The Washington Monument and Lincoln Memorial joined the Capitol on the east-west axis of the plan. The remaining site was the one south of the Tidal Basin, on a north-south axis with the White House. The architect for the Jefferson Memorial, John Russell Pope, was influenced by Jefferson's own architectural talents, most clearly visible in the design of the University of Virginia and his own home at Monticello. The hallmark of Jefferson buildings was the rotunda. Planning for the building was provided by an act of Congress in 1934. Groundbreaking was on December 15, 1938, and the memorial was dedicated on April 13, 1943, on the 200th anniversary of Jefferson's birth. The domed interior of the building is dominated by a 19-foot statue of Jefferson, visible through the openings of the memorial. Four inscriptions are based on the writings of Jefferson. On the southwest wall are phrases from the Declaration of Independence. Other inscriptions include his words on religious freedom, education, and institutional change. The exterior walls of the building, of Vermont marble, reach 96 feet above the entrance. 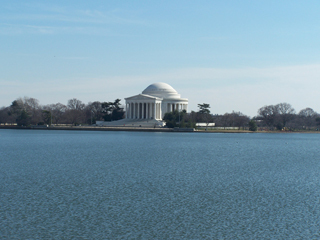 The Thomas Jefferson Memorial is open all year, 8 am to 11:45 pm. It is closed on December 25. Exhibits are located in the basement of the memorial. A bookstore and restrooms are also located in the basement of the memorial.